With 15% fewer calories per oz than our Original Ultra® Whole Body Health® Chicken, Salmon & Duck Canned Cat Food, this formula is designed specifically for overweight or less active adult and senior cats. 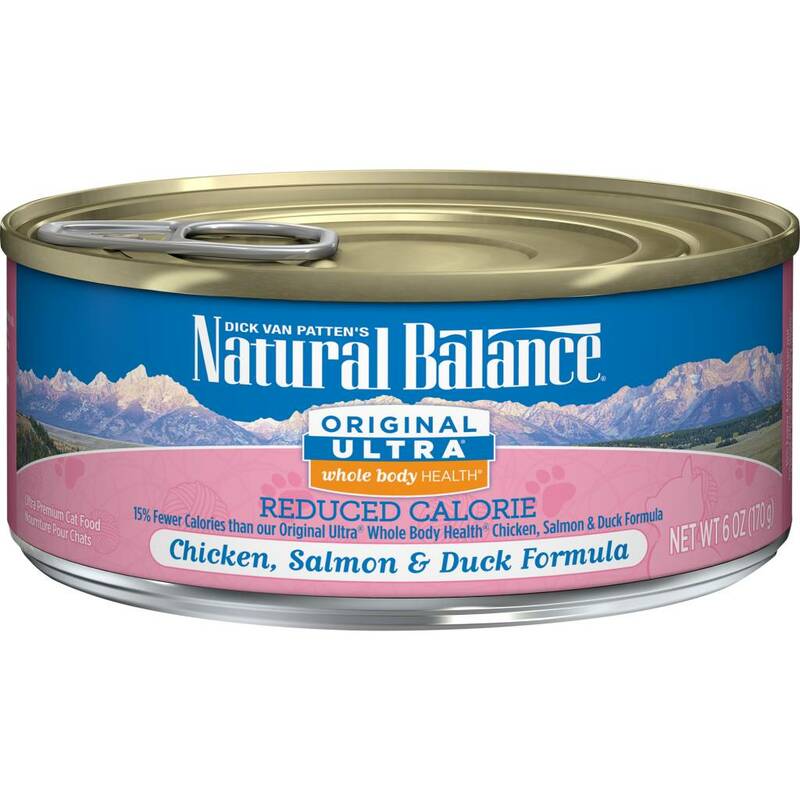 Our Reduced Calorie formula is made with premium ingredients including chicken, salmon, and duck—a highly palatable combination that can also kindle the appetite of older cats. Chicken Broth, Chicken, Chicken Liver, Salmon, Duck, Brown Rice, Chicken Meal, Natural Flavor, Pea Fiber, Oat Fiber, Menhaden Oil, Canola Oil, Dicalcium Phosphate, Vitamins (Choline Chloride, Vitamin E Supplement, Thiamine Mononitrate, Niacin Supplement, Vitamin A Supplement, Pyridoxine Hydrochloride, d-Calcium Pantothenate, Riboflavin Supplement, Folic Acid, Biotin, Vitamin B12 Supplement, Guar Gum, Minerals (Zinc Proteinate, Zinc Sulfate, Ferrous Sulfate, Iron Proteinate, Copper Sulfate, Copper Proteinate, Manganese Sulfate, Manganese Proteinate, Calcium Iodate, Sodium Selenite), Potassium Chloride, Salt, DL-Methionine, Taurine, Carrageenan, L-Ascorbyl-2-Polyphosphate (source of Vitamin C), L-Tryptophan, Cranberries, Blueberries, Dried Kelp, L-Lysine, Yucca Schidigera Extract.